Adhesive mortars are mortars for fixation between various, usually stony surfaces on the one hand, and wall and floor covering materials mostly in a ceramic material on the other. The first real tile adhesives were developed after 1945, originally containing solvents, but after 1959 also produced as water-based. The first paste adhesives had then seen the light of day. 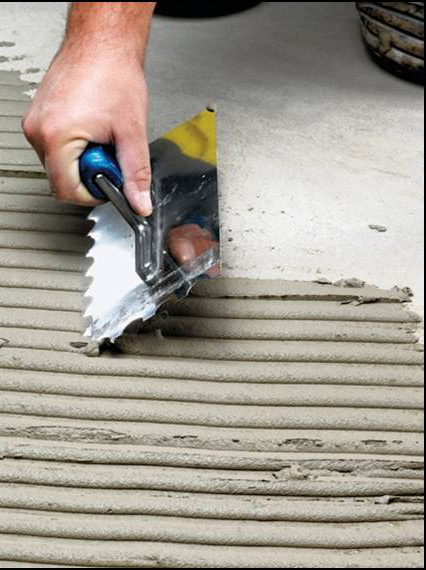 In this period the first thin-bed cement adhesives based on Portland cement also originated. 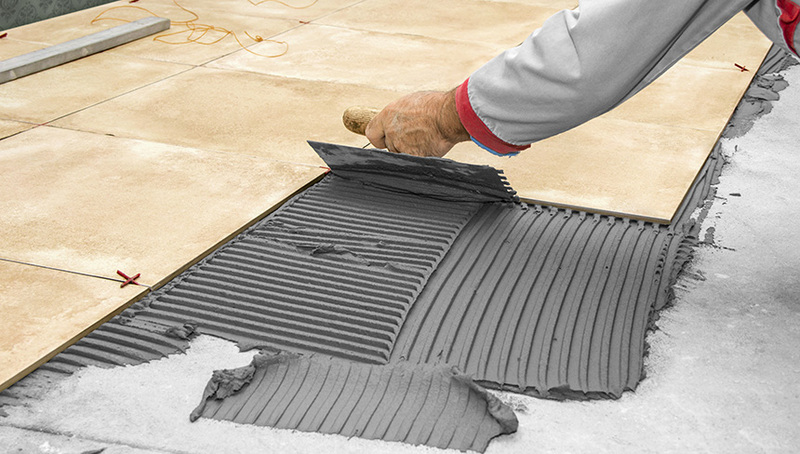 These adhesion methods are universally used today for fixing wall and floor tiles. 1) Tiles can be fixed on practically any type of surface, as distinct from sand-cement mortar that can only be used on a limited number of surfaces. 2) With today’s advanced adhesives (additions to lime mortars) much better bonding is obtained so adhesion to porcelain tiles is many times better. 3) Reduces stress on tiles. This is a particularly valuable property. The adhesive layer retaining a degree of flexibility can be an advantage in a variety of situations. An example here can be frequently applied underfloor heating. 4) It works faster, is pre-mixed so simpler, and results in higher productivity. 5) The structural weight of the installation (the whole construction) is lower. Besides the evolution in tile adhesives (thicker layers, more flexible, fast curing, low-dust, light, etc.) joint mortars are also becoming increasingly important (mould-resistant, more durable, etc.) and with the many colours their aesthetic aspect is an important sales argument with the selection of a tile. Femo strives to promote the quality and innovation of the products of its members, while supplying the necessary information to the users.